Outfielder Nick Williams was one of the highly touted players that the Phillies acquired in the deal that sent Cole Hamels to Texas last summer. 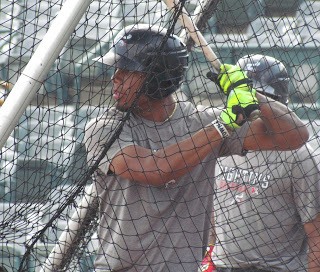 Upon arriving in the Phillies organization, Williams was assigned to Double-A Reading, where he helped the club reach the postseason. In 22 regular season games as a member of the Fightins, the 22-year-old posted a .320/.340/.536 slash line. Overall in 119 Double-A games last season, the promising lefty batting prospect sported a .303 average with 17 home runs, 55 RBI and 13 stolen bases. Williams, a Texas native, took time recently to offer some feedback on his off-season routine and his upcoming plans to visit Philadelphia for the first time and more. Read ahead for that full interview. -Are you still enjoying some down time or have you gotten back to baseball activities yet? I am swinging now. I like to get my work outs done in the morning. Or some days I'll go hit before and then work out after. I'm not swinging every day, but I'm taking some cuts here and there. Just hitting off the tee and soft toss. -Do you pair up with anybody to get your baseball work done and what facility do you use? I usually just use my dad or some of my coaches. I'll go, like, if I use a facility I usually go to (the Texas Prospect Baseball Academy) the Houston Banditos, where I used to play, in Tomball. -How much time do you actually go without picking up a bat and what else do you do during the off-season to stay fit aside from baseball activities? I actually, I mean, I'm always playing basketball or playing 7-on-7. I'm always doing something athletic. I'm on the go. I'm always doing something athletic where I can compete in some way. But, with baseball activities, I usually go till about the middle of December or January because, for me, I just get in the groove really fast with hitting and things like that. -I know after Reading's postseason was done, you went down to Clearwater for instructs for a bit. What was that experience like? I got to meet a lot of people, a lot of the new players, the college players (from this year's draft) and it was a cool experience. It was good to see everything and get used to the area, instead of coming to spring training and not know where anything is or know where I'm going. -I know each January, the Phils will host a group of prospects and they'll go to Citizens Bank Park for a symposium and they'll check out a Sixers game while they're in town, things like that. Is that something that you're slated to attend? Yeah. I'll be in Philly on or around the 10th. -Is that something that you're looking forward to, in order to get a real taste of the city? For sure. I still have yet to go to Philly and I don't know what it looks like or anything, so that'll be a great experience. -From what you've heard about Philadelphia, is there anything that you know it's famous for? I know all the historic stuff like the Declaration of Independence and the Liberty Bell and stuff. Things like that, but, I mean, I used to be a really big Eagles fan back when Vick and DeSean Jackson used to play for them. I think it'll be cool to get there, a good experience. I'll feel like a tourist. I'm willing to try and see and do everything that I can, so that'll be fun. -After being a bit of an Eagles fan, what do you know about Philadelphia sports fans? -That sums it up pretty well. Thanks for taking time, Nick.